Serving Scoop Enclosed! NOW® BetterStevia® is a zero-calorie, low glycemic, certified organic sweetener that makes a perfectly healthy substitute for table sugar and artificial sweeteners. 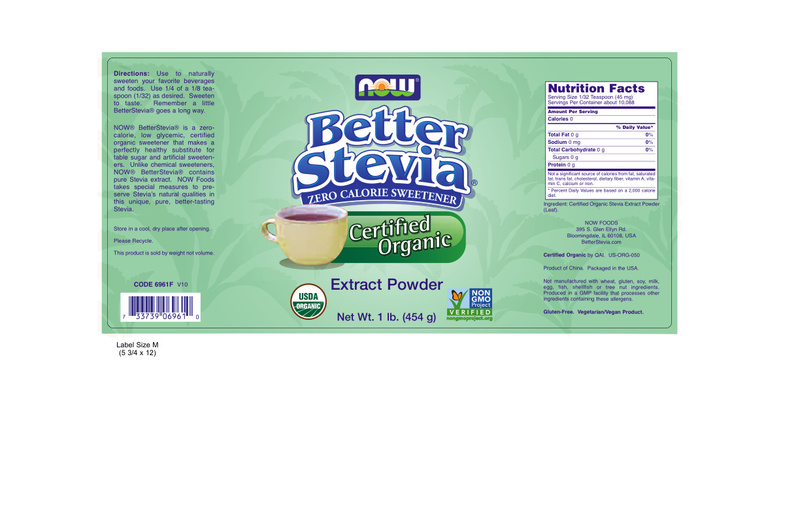 Unlike chemical sweeteners, NOW® BetterStevia® contains pure Stevia extract. NOW Foods takes special measures to preserve Stevia's natural qualities in this unique, pure, better-tasting Stevia. This product is sold by weight not volume. Directions: Use to naturally sweeten your favorite beverages and food. Use 1/2 of a 1 level scoop as desired. Sweeten to taste. Remember a little BetterStevia® goes a long way. Store in a cool, dry, dark place after opening.